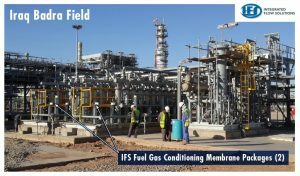 As a manufacturer of modular, engineered process packages for use in the Oil & Gas industry all over the world, IFS helps customers to overcome some of the most extreme challenges in remote locations, as we did in the Iraq Badra Field where the customer was experiencing dangerously high levels of hydrogen sulfide gas (H2S). In 2013, a multi-national Engineering, Procurement and Construction company (EPC) developing a central processing facility in the Wasit province of Iraq encountered a potential dangerous and damaging problem. High levels of H2S, at times exceeding 45,000 ppm, were found in the site’s natural gas. High levels of H2S create a lethal working environment for employees, and H2S-related corrosion can severely shorten the life and performance of the downstream equipment. In addition, if the gas is used as an ignition source, high levels of H2S violate emission guidelines. The project engineer from the EPC had to quickly find a way to condition the gas, stay within tight budget restrictions and complete the project in around seven months. “We faced some extreme budget limitations and extreme deadline limitations,” he said. IFS delivered two Fuel Gas Conditioning Membrane packages skid-mounted and featuring membranes made by PoroGen to be suitable for H2S gas removal. These membranes are manufactured from high performance polyether ether ketone (PEEK) polymers. Unlike traditional polymer membranes, PEEK membranes are resistant to the liquids that can harm conventional membranes. The IFS system solved the problems of cost and ongoing maintenance as the system is less complex, requires fewer rotating components, eliminates expensive pretreatment downstream and operates effectively under varying process conditions. This vastly reduces the “down time” for maintenance. While the skid package was considered a “plug and play” solution requiring few adjustments during installation and little ongoing maintenance during operation, IFS engineers provided hands-on support to the field team in the remote Iraqi region. The IFS team’s presence onsite allowed them to address an unexpected issue that arose – high levels of condensation in the gas stream. Experienced engineers from IFS’ headquarters in Texas collaborated with the local engineer working on the start-up and devised a way to remove condensate from the system, a design feature that is now incorporated into all membrane skids. See Images of the H2S Removal (a.k.a. Gas Sweetening) Skids being completed at the IFS manufacturing plant in Texas and Read the Project Synopsis.